NEW YORK STACK TIP - 1.5" NH INLET 15/16" (24mm) and 1/2" (12mm) Dual stacked tips. 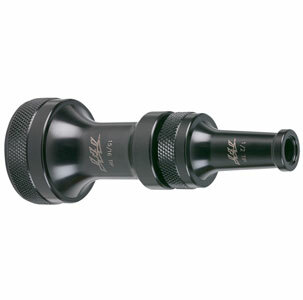 Base tip has a 15/16" (24mm) bore with 1.5" (38mm) NH female thread inlet. Top tip has a 1/2" (13mm) bore with male threads. Base tip outlet has female threads for durability. Easy to read pressure/flow charts are laser engraved. 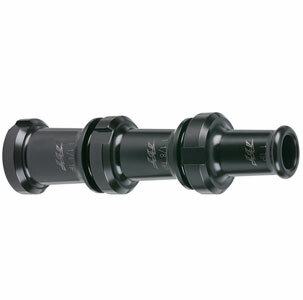 1.5" NH (38mm) inlet thread is standard. NFPA STACKED TIPS 1.5" (38mm) INLET These lightweight tips are hardcoat anodized, and have pressure/flow charts laser engraved on each tip. Orifice openings are 1-1/4, 1-1/8", and 1" (32mm, 28mm and 25mm). Use with valved playpipe H-2VPP for compliance with NFPA 1901 equipment requirements. Each tip is threaded 1.5" NH (38mm). TFT NFPA Stacked Tips 1.5"